I'm a bit behind in my movie reviews, but it's turned out to be timely, with the Oscars just last week. Back on New Year's Eve, my husband and I watched The Big Sick, an original, warm, and funny romcom that is based on a true story. As the movie opens, Kumail, played by Kumail Nanjiani, is doing his stand-up comedy routine and hanging out with his other comic friends. After the show, a pretty blond grad student named Emily, played by Zoe Kazan, talks to Kumail at the bar and tells him how much she enjoyed his set. The two start dating, and for a while, it's a typical romcom story, with two attractive main characters who are gradually falling in love. But Kumail is originally from Pakistan, and his parents - though very nice - are very traditional and expect him to marry a Pakistani girl. In fact, he has to sit through yet another set-up every Sunday, as his mother invites one eligible Pakistani girl after another to meet him at their weekly family dinner. Eventually, Emily gets angry that Kumail won't introduce her to his family, and the two break up. Soon after, though, with both still upset over the break-up, Emily gets very sick and is admitted to the hospital, while doctors try to figure out what is wrong with her as she rapidly deteriorates. Suddenly, Kumail finds himself at Emily's bedside, facing down her parents, played by Holly Hunter and Ray Ramano, for the first time, who know that he's the guy who broke their daughter's heart - awkward! The Big Sick won 16 different awards - many for "Best Movie" or similar - but was passed over for an Oscar last week, much to fans' disappointment. It was nominated for Best Original Screenplay, a recognition of which it was worthy. The backstory adds to its attraction, as Kumail and the real Emily (V. Gordon) wrote the screenplay based on their own real-life love story. As you can imagine, with a stand-up comic writing the script, it's a very funny movie, but it is also very warm and moving, too. Kumail and Zoe are both very good in their roles, as are the supporting cast and especially Kumail's family. As always, Hunter and Romano are fabulous. We both enjoyed it very much. 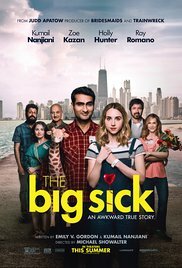 An Amazon original movie, The Big Sick is available free streaming on Amazon Prime or on DVD. This is on my list of must-see movies. I feel as if I haven't seen a movie in so long! It's very good, Helen. We don;t see as many movies now because there is just SO much great TV to watch! Hey, Helen - I was reading your blog today and wanted to leave some comments, but the Comment links were missing from your posts - ? ?